Understanding your customers is fundamental to effective communication. Current segmentation strategies draw on ever more detailed information about how patients, physicians and payers behave through the use of open source, social media and real-world data. However, segmentation still lacks clear insight into why these stakeholders behave as they do – and therefore how best to change their behaviour. 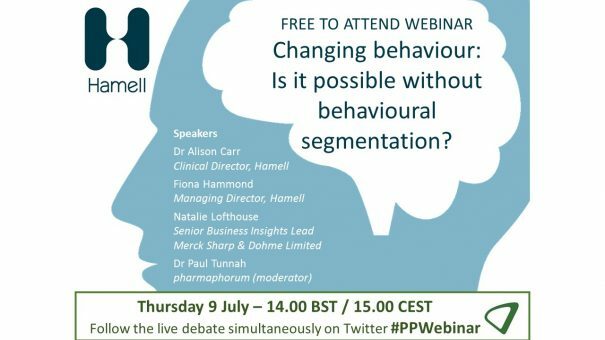 Working with behavioural change experts Hamell, this one-hour live discussion looks at why current segmentation strategies are failing, and the importance of understanding what drives patient or customer behaviour. Using case studies, speakers explore how segmenting by behavioural drivers can create advanced, effective strategies to change patient, customer and payer behaviour. The live broadcast took place on Thursday 9 July at 14.00 BST / 15.00 CEST. To view the on-demand live version, please click here or on the webinar widget below. Fiona and Alison have been running Hamell for the last 7 years. Hamell is a behaviour change agency which uncovers the core drivers of behaviour to provide a deep understanding of what makes people behave the way they do. We use this knowledge to develop communications and interventions to change behaviour in patients, clinicians, pharmacists and healthcare consumers. We passionately believe that changing behaviour is only possible if we communicate with each individual in a way that resonates with his or her core beliefs – delivering the right message, to the right person, in the right way. Fiona and Alison are both scientists and Hamell has a team of internal behaviourists representing different behavioural disciplines, supported by our associates – thought leaders in behavioural science and behaviour change from leading UK academic institutions. Natalie has been a member of the Business Insights team within Merck Sharp & Dohme for 3 years and during this time has supported many franchises, currently focusing on oncology. The Business Insights team prides itself on being business partners, who provide insight and recommendations, and are integral to driving strategy and business decisions. Its objective as a team is to allow data to tell a story and provide a deep understanding of the business through innovative solutions, analytics, market research and forecasting, whilst having customer focus at its core.